Before you build your shed, get all the know how you'll need by taking a look at our detailed instructions and video tutorial to constructing an 8ft x 6ft double-door apex shed. Grab a friend and beginning with the base, build your shed from the bottom up, moving from the floor, to the walls, roof, windows and doors. Want to download the .pdf guide version of this how-to? Just click the button below! This guide is based on the construction of an 8ft x 6ft double door apex shed. 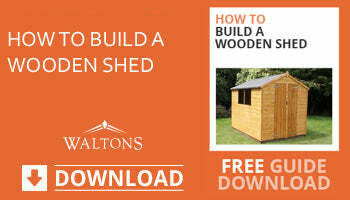 While sheds come in many shapes and sizes, these steps will give you a clear outline of the process of constructing any wooden shed. The full instruction video follows below. Always follow the instructions that come with a new shed. This guide gives a good outline of what to expect, but there may be variances between different models. Remember to pre-drill all screw holes to avoid splitting the wood. It’s best to have two people to build a shed. Clear the shed base area of anything that might get in the way - including overhanging branches. Make sure your base is level and secure. For larger sheds, consider a concrete base (always the best option). A wooden base is fine for smaller sheds. Be sure that you have enough space to be able to get all the way round your shed when it’s built. Remove transportation blocks from the panels with a hammer. Fit the doors first. Lay the front gable end flat on the ground and line up the doors into place before securing the hinges. Drill pilot holes before screwing the hinges into position. Place the floor panel down on your base, and make sure the bearers are flush with the base edge. Start constructing the building with the rear gable and one side of the shed upright and forming an L shape. Align the panels so that the framing pieces are firmly against each other, and flat on the floor. Pre-drill screw holes, and screw the panels together at the top, middle and bottom. Add the second side panel to the rear gable and secure in the same way. Secure the front gable (with the door installed) with screws at the top, middle and bottom. Secure an L bracket to each end of the roof's ridge bar. Align this to the top of the shed's apex, and screw into position at each end. Lay the roof panels on the ground, and slide an eaves frame underneath, making sure it's flush at the side and ends. Secure the roof panel to the eaves frame with screws. Remember to pre-drill all your screw holes. Slide the roof panel up on the gables, and secure into place by screwing the board into the frame below, along each edge. Repeat for the other side. Measure and cut the roof felt to size, remembering to leave a two inch overhang on all sides. Roll the felt out onto the roof, tack at the top two corners, then secure along the bottom edge. Pull the felt out firmly to prevent wrinkles. Add more felt if the roof board isn't covered. Repeat for the other side, and then roll out the last piece over the apex of the roof. This should overlap the felt on each side, and be secured along the length on both sides. There's a handy guide dedicated to fitting a felt roof here. You could also consider shingles, or an EPDM roof. Align the wooden corner trims over the side panel framing, and secure at the top, middle and bottom with screws. Repeat this for all four corners. Fold down the roof felt overhangs, and affix the fascia boards to the ends of the roof. Secure at each end, and the middle. Pre-drill a screw hole to the finials, and affix to the apex at each end to neaten the appearance. Trim any roof felt with a knife. Working outside the shed, insert a plastic glazing strip onto the window lip. Put a pane of styrene in the frame, and cover one edge with a framing piece. Repeat for the second pane before adding the centre frame piece. Score around the edge of the panes both inside and out, and peel off the protective plastic. Fix door blocks on the top, middle and bottom of one door with screws. This door becomes the 'slave' door. Attach a turn button onto the top and bottom blocks inside the slave door to prevent the door from opening. Screw door strips to the 'master' door, across the door gap, and secure at the top and bottom. Add another turn button to the outside of the slave door to prevent the master door from swinging open. Treat your shed when it’s built, and annually, with a good quality timber preservative to keep it protected from weather damage.